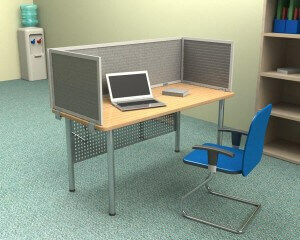 Whether your customers have traditional cubicles or a benching system with no panels at all, we have a solution that will suit their workplace. Our universal mounting brackets fit all standard panel widths and desk thicknesses. The range of sizes and materials gives them plenty of choices for an off-the-shelf solution that we can get to them with a short delivery time of just three weeks. There’s a wealth of information available about how distractions, noise, and lack of privacy reduce productivity. The move toward low or no cubicle walls and a completely open office has started to look like less than a brilliant idea. Employers know they need to do something about this problem. If you ask any of your customers if their employees would appreciate a work environment that increases focus and reduces stress, what do you think they will say? Does your client want custom sizes? We can do that. How about custom fabrics or paints? We can do that. Maybe the client would like some graphics that create a vibrant work environment or highlight their corporate brand? We do that too. Because we have the facilities and equipment right here to make each OBEX panel, we can help you say ‘yes’ to almost any customer request.